If you like classic and easy to play online slots than Fruit Slots may be THE game for you. There are 3 reels and 1 payline in the game and on a single spin you can win as much as 2,500 coins or $12,500. The betting range is from 25 cents to $15 per spin, so as you can see you do not have to be a high roller to enjoy this free slot machine. You can also play it here with no registration or download required. While there is a scatter symbol there are no many other features with no wild symbol, multiplier, bonus game, or free spins. It's not hard to guess the symbols in Fruit Slots, as they are cherries, lemons, oranges, plums, watermelons, bars, stacked bars, and a fruit bunch. 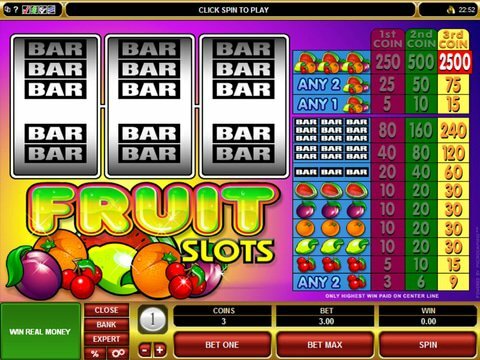 The fruit bunch is the symbol you want to see, as whenever it shows up on the reels you get a payout and you will hit the max payout, depending on what your bet is on that spin, by spinning on 3 of them. The colorful paytable with all the winning combinations and their payouts is right next to the reels. The graphics in this free Microgaming slot are very bright and colorful and the sounds are pretty cool yet very basic. There are 2 features in the expert mode and the demo mode. The expert mode allows you to take advantage of the autospin feature and in the demo mode you can play the game for free. All of the 3 betting control buttons are located at the bottom of the screen and to win the top cash jackpot you need to click the Bet Max button and then spin on 3 of the fruit bunch symbols. Play Fruit Slots at this highly recommended Canadian casino, All Jackpots. They take care of their Canadian players by giving out 100% up to $200 in free casino cash.